"I Do inform yo that the pig Will not stop With you, for some monce ago She got out, and now is hevy and Cannot perform Well till after a few Dais, and thare Was a mistake in the man that advertises for us Which We did not mean to have him come so far West." 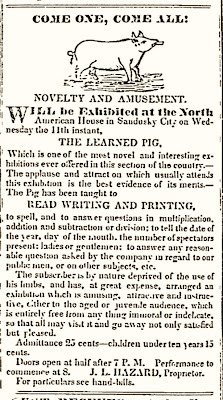 On hearing that this same pig would soon be appearing in Sandusky, the editor of the Register, noting the writer's numerous errors of spelling and grammar, declared that "judging from the letter, if the pig is not more 'learned' than his master, he is no great shakes." 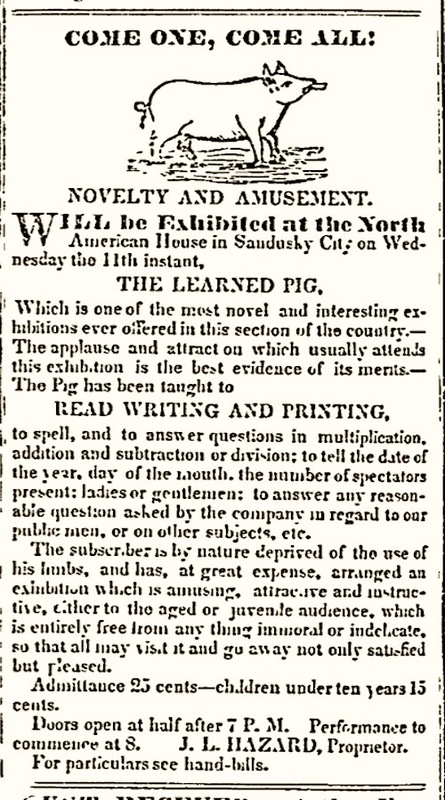 It seems that the pig's proprietor took this criticism to heart, purchasing a large display advertisement, and perhaps paying someone at the Register to write the copy -- for it's reasonably well-written and error-free. When in Cleveland, the pig appeared at a tavern near Doan's Corners, later the intersection of East 105th Street and Euclid Avenue, and a well-known area for movies and entertainment until the neighborhood hit the skids in the 1950's; the site is now completely overtaken by the "campus" of the Cleveland Clinic. The Sandusky appearance was at the North American House, a hotel which stood on the site until 1926; fittingly enough, it is now the site of the Board of Education for Sandusky City Schools.